Cardiovascular disease, also called heart disease or CVD, involves disease of the heart and blood vessels. There are many types of disabling heart conditions. Various types of heart disease and cardiovascular problems qualify for long term disability (LTD) insurance benefits, if the medical conditions cause severe limitations in what the patient can do. Generally, an LTD insurance adjuster will look at whether you’ve had poor exercise tolerance tests showing that you cannot do much physical exertion without fatigue or angina, imaging results or other test results showing abnormalities of the heart muscle or the vessels leading to heart, or whether you have been hospitalized several times in the past year. Many heart conditions are related to a process called atherosclerosis. Atherosclerosis is a condition that develops when plaque builds up in the walls of the arteries. This buildup narrows the diameter (or width) of the arteries, making it harder for blood to flow through. If a blood clot forms in the narrowed arteries, it could stop the flow of blood. This can in turn cause a heart attack or stroke. A heart attack occurs when a blood clot blocks blood flow to a part of the heart. If this clot completely blocks the blood flow, the part of the heart muscle supplied by that artery begins to die. Most individuals survive their first heart attack and return to their normal lives to enjoy many more years of productive activity. An ischemic stroke is the most common type of stroke. It happens when a blood vessel that feeds the brain gets blocked, usually by a blood clot. When the blood supply to a part of the brain is shut off, brain cells will die. The result will be the inability to carry out some of the previous functions, including functions such as walking or talking. A hemorrhagic stroke occurs when a blood vessel in the brain bursts. The most likely cause is uncontrolled hypertension. Some effects of stroke are permanent if too many brain cells die after a stroke due to lack of blood and oxygen flow to the brain. These cells are never replaced. The good news is that some brain cells don’t die — they are just temporarily out of order. Injured cells can repair themselves. Over time, as the repair takes place, body functioning improves. Also, other brain cells may take control of those areas that were injured. If this occurs, strength, speech and memory may improve. A heart attack occurs when there is a sudden blockage to an artery that supplies blood to an area of the heart. Coronary heart disease is the most common cause of death in the United States. It is one of the major cause of disability, with many patients reporting impairments or requiring assistance with daily activities. Deep vein thrombosis (DVT) is a blood clot in one of the deep veins of the body, usually in the leg. Arrhythmia is an abnormal rhythm of the heart. There are various types of arrhythmias. The heart can beat too slow, too fast or irregularly. Bradycardia is when the heart beats less than 60 times per minute. Tachycardia is when the heart beats more than 100 times per minute. An arrhythmia can affect how well the heart works, especially when the heart is not be able to pump enough blood to meet the body’s needs. Atrial fibrillation, often called A-Fib for short, is one of a number of disorders commonly referred to as ‘arrhythmias’, where the heart does not beat normally. Familial hypercholesterolaemia is an inherited condition in which the body does not remove enough cholesterol from the blood. This causes high total blood cholesterol levels and early onset of coronary heart disease in some patients and their families. Cardiomyopathy is a condition in which the heart muscle becomes inflamed and enlarged. Because it is enlarged, the heart muscle is stretched and becomes weak. High blood pressure (also known as Hypertension) is the pressure of the blood in the arteries as the heart pumps it around the body. Cholesterol is a fatty substance produced naturally by the body and found in the blood. This does not mean that the heart stops beating. Heart failure, sometimes called congestive heart failure, means the heart is not pumping blood as well as it should be. The heart keeps working, but the body’s need for blood and oxygen is not being satisfied. Heart failure can get worse if it’s not treated. 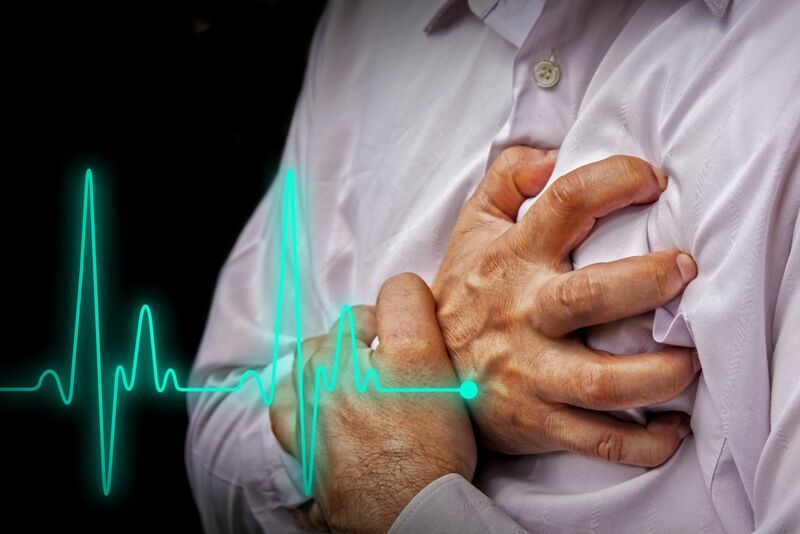 Heart palpitations are feelings or sensations that one’s heart is beating too hard (or “pounding”) or too fast (or “racing”), skipping a beat, or fluttering. They can be felt in the chest, throat, or neck. Angina is chest pain or discomfort caused by insufficient blood flow and oxygen to the muscle of the heart. Coronary artery spasm is a temporary discomfort or pain that is caused by a temporary spasm in one or more of the coronary arteries. Stenosis is when heart valves don’t open enough to allow the blood to flow through as it should. When the heart valves don’t properly close and allow blood to leak through, it’s called regurgitation. When the valve leaflets bulge or prolapse back into the upper chamber, that creates a condition called mitral valve prolapse. When this happens, they may not close properly. This allows blood to flow backward through them. If you have one or more of these heart conditions and you are unable to work, you may be eligible for long term disability insurance benefits. In each claim, the insurance company will review all of a claimant’s medical documents and information as evidence in the “proof of loss”. The Ortiz Law Firm handles all manner of heart problems. If you are unable to work as a result of cardiovascular disease, you should consult with a heart disease long term disability attorney. Unfortunately, long term disability carriers do not make it easy for disabled claimants to receive the benefits that they deserve. If your cardiovascular disorder makes it impossible for you to work and you have been denied your long term disability benefits, Mr. Nick Ortiz can help you cut through the red tape and fight for your disability benefits no matter where you live in the United States. Give us a call today to discuss your benefits at 850-308-7833.